This page defines the functions attributed to the ASSIGNABLE SWITCHes on the camera body. FAN MAX - used to cool off a hot camera, see page M10 for other fan options. 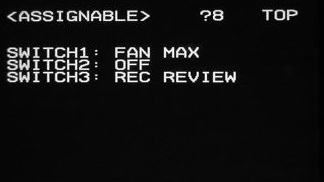 The REC REVIEW function automatically rewinds the tape, and plays back the last 3 seconds of the footage recorded on tape, and then cues the tape for the next recording. Many Camera Assistants use REC REVIEW as a digital version of "checking the gate". Some Assistants will put a tail slate at the end of the take to easily distinguish between similar takes. 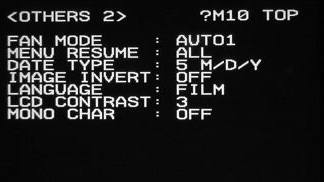 The ASSIGNABLE SWITCHES on the camera body are depicted below. 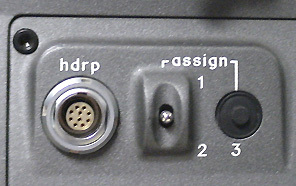 On the right is SWITCH3, a supple black push button. To its left is the two-position SWITCH1 (upwards) and SWITCH2 (downwards).